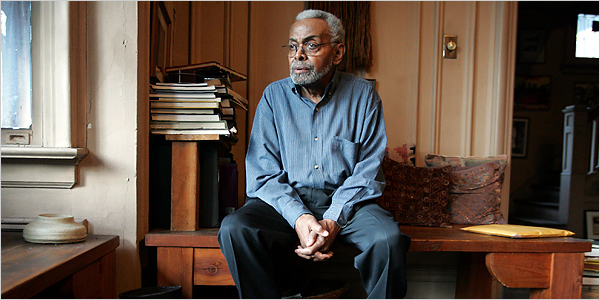 Years ago, my professor William J. Harris -- a crucial guide for me on poetry, jazz and black arts -- introduced me to an early Amiri Baraka essay "How You Sound??" (1959) that focused on poetry. I was reading the essay in 2000 after hearing recent live recordings of Baraka reading his work and after considerable exposure to spoken word and rap. So the idea of "how you sound" resonated in ways for me well beyond what was in that essay. Lately, I've been giving thought to the idea of "where you stay" and how place of residence might shape the publishing histories of poetry and the topics addressed by individual poets. Perhaps not surprisingly, Baraka is one of the writers who comes to mind for me as I think about that subject. He might be one of the few major black poets who resides in an economically struggling neighborhood; he's lived in Newark, New Jersey, for more than four decades now. Several of Baraka's well-known poems -- "Black People!," "Black Art," "In Walked Bud," "Dope," -- address aspects of living in an black, urban environment. Before one reading, Baraka announces that "This is a poem I guess that reflects, uhh, living in Newark, but uhh, I guess living in any ghetto. It's called 'Dope.'" These days, it's less likely to hear that kind of preface to a poem by major or well-known poets because being major and well-known today so often means having the financial resources to not live "in any ghetto." I should pause here, because the issue of where one resides in proximity to various other racial groups is a sensitive subject for black folks in particular. I'm not calling anyone a "sellout" for living in primarily non-black neighborhoods nor am I throwing out "keeping it real" props to folks who live in the hood, so to speak. Instead, I'm just thinking that place(s) of residence is one among many factors that we might consider as we try to better understand the overall development and production of African American poetry. That Gwendolyn Brooks spent almost all of her life in Chicago was important to her work, don't you think? Langston Hughes's Harlem connection was also central to his work and career. Baraka was born in Newark in 1934, and although he has lived various places at different times, he has lived in his hometown for the majority of his life. Beyond those three major poets, however, it'll take more time and extensive work to figure out what place of residence might mean for the larger histories of black poetry. For now, I remain curious about the relationships between where you're from, "where you stay," and "how you sound."